Trolling the web recently for great fall decorating ideas, I came across a few really fantastic ones on the Better Homes and Gardens website. What a statement this one makes! 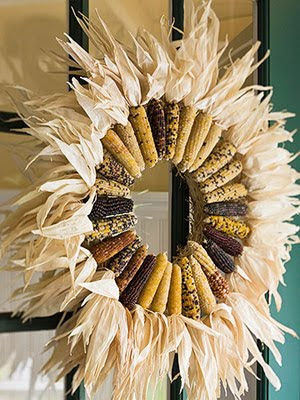 Great Wow factor here with just a couple of supplies..... a straw wreath form and lots of indian corn. This would be beautiful displayed over a mantel as well as on the front door. I can even see it as a centerpiece of your Thanksgiving table or Thanksgiving buffet lying flat on the table with a platter of food in the center. 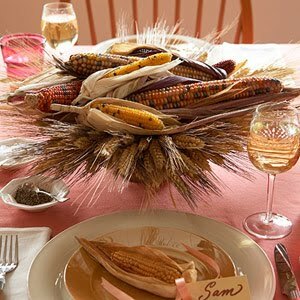 Another way to use indian corn is to pile it on a pedestal stand and combine it with some wheat for a beautiful Thanksgiving or fall centerpiece. I love how BHG uses gourds as vases. 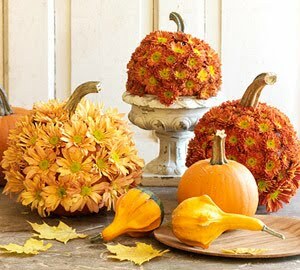 I found lots of examples of these on their site, but basically you cut off the top of the gourd and scoop out the flesh to create a perfect holder for your fall flower arrangements. 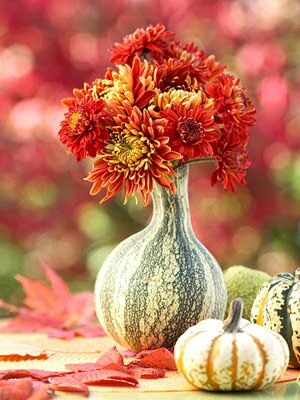 Add a few mini pumpkins and leaves around the gourd and turn it into a beautiful centerpiece for your table. Mum covered pumpkins is another easy way to add a little flair to your fall displays. Fresh mums are beautiful here, but finding a good quality artificial mum to use so that you could have it as a fall decoration year to year would be nice option. 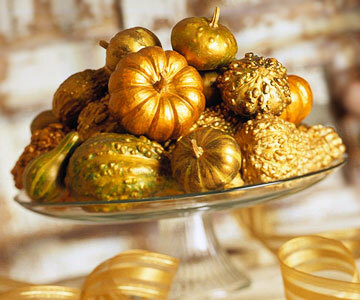 This is another simple but fabulous idea -- paint your gourds gold or other metallic colors. You can find out more here on the Better Homes and Gardens website. 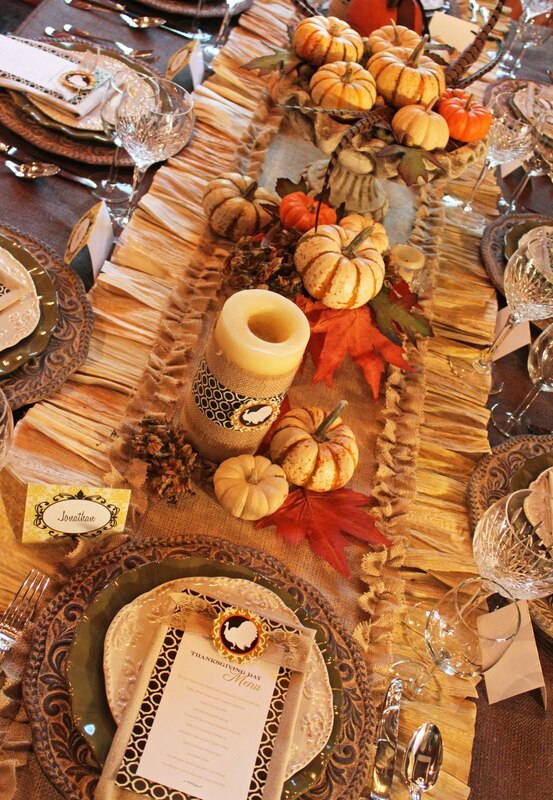 I hope you are all getting your tables and recipes ready for a fabulous Thanksgiving! I'll be posting a tutorial tomorrow on the corn husk and burlap runner (pictured above) that I made for my own Thanksgiving table. 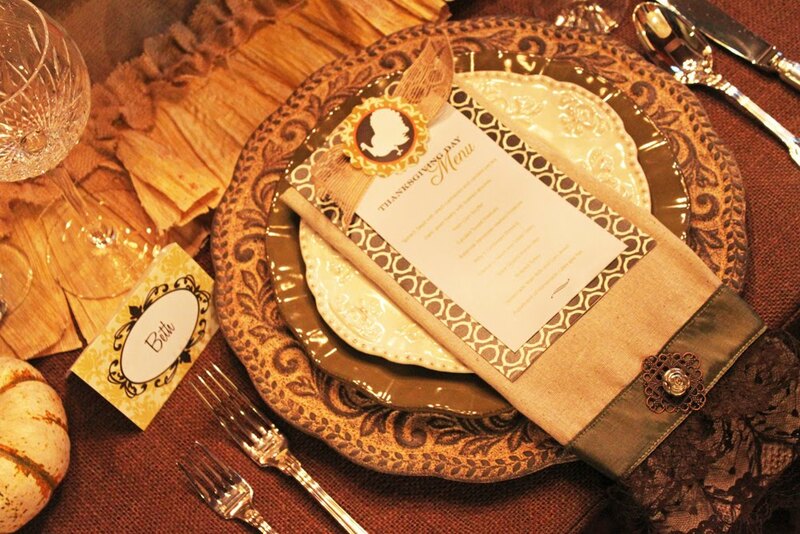 Stay tuned for a really simple and beautiful table runner idea. And for those of you who don't sew, there's a no-sew option, too! Don't forget to order your personalized Thanksgiving printables set -- it's on SALE NOW for 40% OFF! I just love decorating and BHG always has fantastic simple ideas.